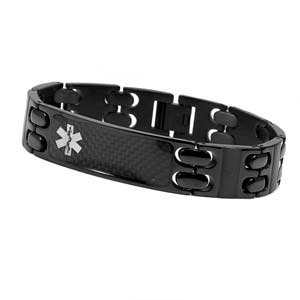 Wear this black stainless steel link medical ID bracelet for a stylish way to keep yourself protected. Bracelet has an interlocking clasp. The bracelet width is about 1/2 an inch. 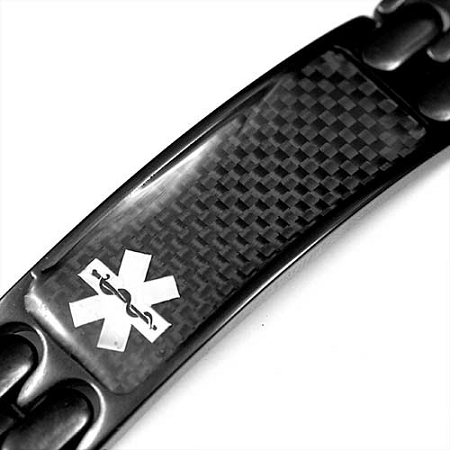 The bracelet is available in two lengths to fit wrists from 7.5 to 8.5 inches. Medical ID wallet card included. I had been looking for an ID bracelet for a few months and I was pleasantly surprised when I found this item. The style is great and the quality speaks for itself. Definite winner.